As it goes with any purchasing choice, there are several things you should take into account when you are searching for the right pocket knife. The first things you should figure out are what features you are looking for. Obviously, if you are looking for a pocket knife, you want something relatively small, but how small? How many blades do you want your pocket knife to have? Do you want a pocket knife that also acts as a small tool kit? After you have decided what you want from your pocket knife, you will need to figure out how much you can afford to spend. Prices vary drastically, depending on style, features, and even the maker of the pocket knife, so make sure to set a budget before you start shopping, and stick to it. Lastly, you will need to decide if you want to go out and purchase your new pocket knife in person, where you can hold it and get a sense of it, or if you want to purchase online, where you are likely to find a better deal. A great idea is to search around a bit before making your decision. Look at prices online and in person, maybe you can find the pocket knife you love online, after being able to check it out in a store. Now we are going to over the features and styles of a few great small pocket knives that are on the market right now. These are all great options, in a variety of styles and costs, and with a variety of features. My favorite, go to pocket knife has become the Patriot by Banner Knives. This is a great folding knife that is perfect for every day carry. It has held up to every task I’ve undertaken with it, and has all of the features I wanted (like an ambidextrous thumb stud and built in belt clip). It also looks and feels awesome with a carbon fiber printed handle. Probably the most famous of pocket knives, the Swiss Army Knife has been around in one form or another for over a century. Although there are many options when it comes to the Swiss Army Knife, we will stick with the Classic for the purposes of this article. The Classic is only two and a quarter inches long, and works as a perfect compact set of tools for any outdoors man. This pocket knife comes with several fold out features, including a small blade, scissors, and a nail file with a screwdriver tip, as well as a pull out toothpick and set of tweezers. 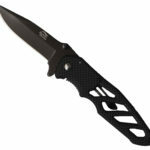 On the other end of the spectrum, we have the Tac Force TF-705 Series Assisted Opening Folding Knife. This pocket knife is much more stylish, and yet very simple. When closed, the Tac Force TF-705 Series Assisted Opening Folding Knife is only four and a half inches long, so it sits comfortably in just about any pocket. It has only one high carbon, partially serrated, drop point blade, with a very sleek grooved aluminum handle and built in bottle opener. The Schrade IMP16S Imperial Stainless Steel 3 Blade Pocket Knife comes with an elegant and classic look. The celluloid handle has a gorgeous stained wood look to it, and with all of the blades folded in, this pocket knife is not even three and a half inches long. The three multipurpose blades are all made of 400 Series Stainless steel, so you can be sure the Schrade IMP16S Imperial Stainless Steel 3 Blade Pocket Knife is going to last for quite some time. Another beautiful folding pocket knife is the Kershaw 1670S30V Blur Knife. This pocket knife is made with speed safe knife opening system, which is patented technology designed to give users another line of protection against accidental injury. When closed, the Kershaw 1670S30V Blur Knife comes in at only three and a half inches long, and that number is nearly doubled when the S30V stainless steel blade is out. This pocket knife is made for easy one handed opening, and safe handling even in wet conditions. The Spyderco Delica 4 Lightweight Blade Combination Edge Knife is the fourth edition of one of Spyderco’s most popular pocket knives. The handle is made of fiberglass reinforced nylon, and designed to give the user an easy and safe grip. The black handle and VG-10 steel blade blend well together, giving the The Spyderco Delica 4 Lightweight Blade Combination Edge Knife a handsome, rugged look. This pocket knife is also made with an easy screw together design, which makes it very simple to clean and maintain. For something a little more old fashioned, but no less functional, the Boker Beer Barrel Congress Pocket Knife is a beautiful choice. The four multipurpose blades are made of C-75 carbon steel, and when closed, the knife is less than four inches long. The handle is gorgeous, crafted of genuine German beer barrels with brass liners and solid nickel silver bolsters. The classic Tree Brand blade etching tops the Boker Beer Barrel Congress Pocket Knife off to make it slick and serviceable for any user. For the hunters out there, sometimes finding an appropriate pocket buck knife can be difficult. Luckily, the Buck 110BRS Fld Hunting 3-3/4″ pocket knife is a perfect utility knife to keep with you, no matter where you are searching for prey. 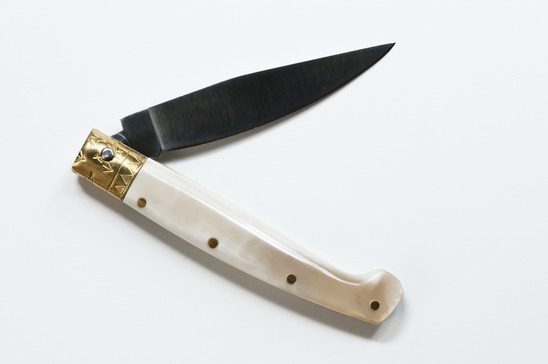 One fo the bigger knives on this list, the Buck 110BRS Fld Hunting 3-3/4″ is nearly five inches long when closed, but still thin and light enough to fit nicely in your pocket. The blade is made of 420HC steel, and the handle is dymondwood wood-grain with polished brass bolsters. 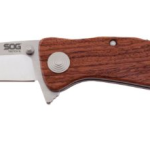 This pocket knife also comes with a gorgeous leather sheath, and the 4-Ever Buck Lifetime Warranty. For a sleek, single blade pocket knife, Heckler and Koch has been one of the top brands in the market for more then fifty years. Their Benchmade Design HK Ally Knife shows us exactly why. This pocket knife has a AUS8 Stainless Steel blade that is less that three inches long, and honed to perfection. As far as overall handiness goes, the Benchmade Design HK Ally Knife is hard to beat, as it comes with a removable steel pocket clip and an ambidextrous thumb hole opener. At less than seven inches long when unfolded, this pocket knife is perfect for carrying every day. Although it comes in at the higher end of the price spectrum on this list, the Gerber Bear Grylls Scout Drop Point Knife is well loved and reliable. The blade is half serrated high carbon stainless steel, and when closed it is only four and a quarter inches long. For easy one handed opening, the Gerber Bear Grylls Scout Drop Point Knife has a Dual-sided thumb stud and comfortably textured grip. This pocket knife comes with a clip, and the priorities of survival pocket guide. As far as beautiful pocket knives go, it would be hard to compete with the Case Cutlery 02864 Mini CopperLock Pocket Knife. This pocket knife comes in multiple colors and has a genuine bone handle. The locking clip blade is made of Tru-Sharp surgical steel, and the Case Cutlery 02864 Mini CopperLock Pocket Knife is made in America and comes with a limited lifetime warranty. The textured bone handle gives the user a strong and safe grip, and measures well under four inches when closed. Of course, these are really only a few of the thousands of options that are out there when it comes to quality pocket knives. With a little bit of time and research, finding the perfect pocket knife for you should be simple.